Trade what you see. How many times have you heard that phrase in the trading community? Well, now you can with Angle Trade Lines. This expert advisor brings your strategies alive offering the ability to trade visually and along any slope! Angle Trade Lines (ATL) lets you focus on your analysis and handles the essential mechanics of trade management for you. Simply drag and drop Pending Orders, Price Targets, Stop Loss, directly on the charts, and position them just the way you need. WOW! ATL is unlike any other expert advisors ever encountered. It is a paradigm shift for independent retail traders in the way today’s traders can embrace controlled automatic trading. Unlock the advantage of power and precision offered with your investment in computing strength and high-speed Internet service to compete visually today. What does this app provide? Place advanced pending order types. Buy Stop, Sell Stop, Buy Limit, Sell Limit are all supported. Automatically set a Stop-loss and Take-Profit based on your pre-defined strategy. Want to place a stealthy Stop Loss? Maybe one that takes advantage of price and time? Just drag it into place. 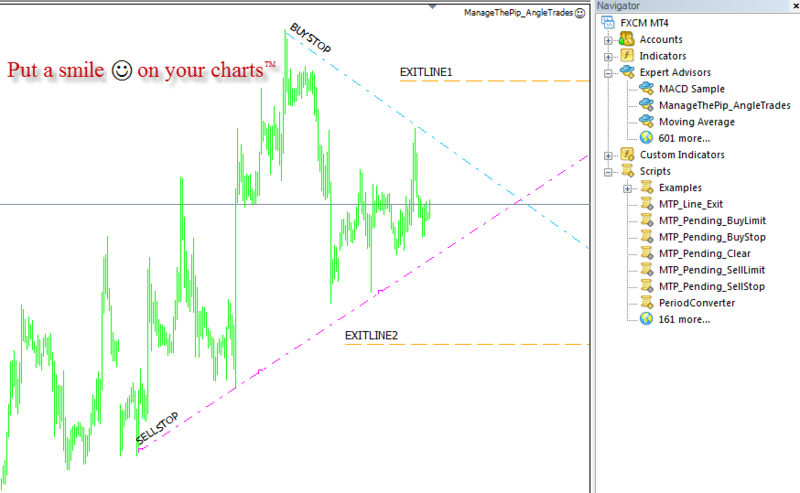 Place pending orders along a forming triangle or box in a range. Drag-and-drag pending orders along any axis, any pattern, for any strategy. Build strategy profiles like a sports playbook to take full advantage of your portfolio or defined methodologies. Remember, it’s your trade plan – work it! There is no guarantee that the systems, trading techniques, trading methods, indicators will result in profits or not result in losses. FXCM is an independent legal entity and is not affiliated with Manage the Pip. Manage the Pip is not owned, controlled, or operated by FXCM and Manage the Pip is not an employee, agent or partner of FXCM.